Brisse Monfort of Valenciennes, in northern France, is possibly the father of Jan Monfoort, born in France, but no proof has been found to confirm this. Little is known about Brisse but he is in the right place, at the right time, to be the father of Jan.
Jan, the first of the family to arrive in Niew Amsterdam in 1624, had probably been in the Netherlands for several years before he agreed to sign on as a settler with the Dutch West Indies Company and sail to Niew Amsterdam with his wife and family. He was born in Valenciennes and was in the Netherlands to escape the anti Protestant movement in France. His religion was French Huguenot/Protestant at a time when Catholics controlled France and persecuted anyone not of that faith. Jan and his wife Jacqueline secured passage on the ship EENDRACHT whiich sailed from Amsterdam in January of 1624, landing at the tip of Long Island in March of that year. For their passage, they agreed to live in this new world for 6 years and would receive farmland, a house, barn, laborers, farm implements and animals. The settler in turn would pay the Dutch West Indies Company what amounts to forty [$40.00] a year in rent and 80 pounds of butter. It is not clear if children accompanied them, but I think it is reasonable to assume that one to three children came with their parents. About 1630, the family returned to the Netherlands. The reason is not certain. They had fulfilled their bargain with the Dutch West Indies Company. I suspect it may have been legal business that caused their return to Holland. Perhaps his father had passed away or his in laws, and he was needed to take care of the estates. The answer wlll probably never be known for certain, but they did return to Niew Amsterdam, in 1636, and this time remained in the new world. With them came their son, Peter and his wife, Sarah dePlanck. whom he married in Amsterdam March 23, 1636. Peter had been born in Valenciennes, France about 1616, his wife was born about 1615 in Amsterdam, Holland. Their intention to marry was registered in the Walloon Church of Amsterdam the first of March 1636. Little else is known about Sarah. In 1639, Peter, entered into a partnership with Cicero Alberti,to start a plantation for the growth of tobacco, corn and any other grains they felt necessary to grow. The partnership was to last for 4 years, they would have equal authority on the running of the plantation, assist each other in the planting and fencing of the property and would share any profits or losses equally. In a bit of irony, this website owner is also a descendant of Cicero Alberti, through her mothers line. 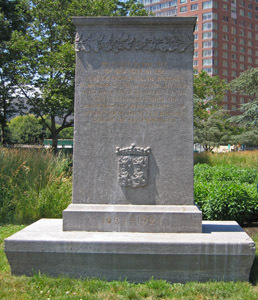 **Alberti has been honored in NYC with a placque stating he is the first Italian in the colony of Niew Amsterdam. The area where Alberti and Peter Monfoort lived and farmed together is now known as Brookyn, but in the 1600's it was spelled Breukelen. Monfoort served as a Magistrate in Breukelen, and was among the first members of the Breukelen Dutch Reformed Church, with him serving as deacon. Following the death of Pete Monfoort, his widow, Sarah married Lambert Bosch on January 1, 1663. She is last named in records of the Dutch Reformed Church in the year 1664, when she was a witness to the baptism of Sara Salmie. The Monfoorts had four known children, Peter, Jan, Jannetje, and Sara. Peter would marry about 1676, Marretje Luyster. Sara would marry about 1674 Claes Wyckoff, and Jannetje would marry Willem Coewenhoeven. The fourth child, Jan, would marry Ida/Yda Brinckerhoff, granddaughter of the U.S. Brinckerhoff Family founder. Joris Dircksen. Jan and Ida would marry in 1687, This is the line I will deal most with as it is my line of descent.